28″: L47.5*W28.5*H71CM, Weight: 4.7kg. Unique 4 corner riveted protective shells not only protect your belongings, but also enhance overall durability. 4-wheel design allowing for 360 degree rotation for the light effortless manoeuvring; Two click locking push button trolley system for further control; elastic compression straps and organised pocket keeps everything in place. Dividable interior, internal pockets, packing strap and mesh pocket, cross ribbons, 100% polypropylene zipped case provide an excellent protection for your belongings. Re-enforced corner zones increase strength in the areas most likely to take abuse from handlers. Side soft grip carry handle/Grab handle on base for ease of lifting in and out of a car boot etc/Expanding trolley handle/Robust, smooth, heavy duty zippers on the main body that can be locked. 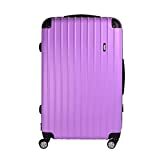 This entry was posted in Luggage and tagged EFORINK, Hard, Lightweight, Luggage, Purple, Shell, Spinner, Suitcase, travel, Trolley, Wheel by Perfect Vacation. Bookmark the permalink.